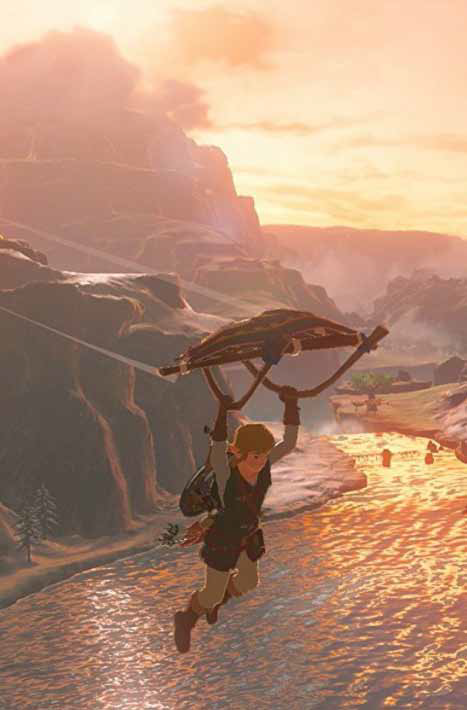 Breath of the Wild allows you to make your own decisions, offering little in the way of hand-holding or direction. Instead, the game prefers to let you find its loose threads and tug at them until you unravel it’s many mysteries on your own terms. You’re free to venture anywhere on the map, regardless of your progress in the main story, or pitting yourself against enemies beyond your echelon. The awe sets in immediately after emerging from a tomb where our hero Link has spent the last 100 years in hibernation. As he makes his way to the edge of a cliff and Hyrule comes into view, you’re faced with the striking scale of this new world. Which is by far the largest the series has ever seen. You begin your standard quest to defeat the ever evil Ganon and rescue Princess Zelda with little more than a tree branch to defend yourself. Almost every enemy wields a weapon or a shield. Kill them, and their gear is yours for the taking. This is essential given that every weapon has limited durability. You will blow through dozens if not hundreds of weapons throughout your journey. It’s truly heartbreaking at first to see your favorite weapon destroyed mid-battle, but you learn to move on. There’s no shortage of new gear to discover, and though you aren’t able to utilize a consistent set of familiar weapons, you learn to expect that for each one that breaks, there’s something greater coming down the road ahead. Beyond weaponry, Link gains access to a magical set of skills known as runes. These include things from explosives, to magnesis, to stopping time, which help you to add diversity to your fighting style. You’ll spend a lot of time in shrines trying to complete the mindbending puzzles within, which often require you to use a combination of these abilities to overcome trivial obstacles. Completing these puzzles rewards you with a Spirit Orb which you can exchange for an extra stamina or heart vessel. 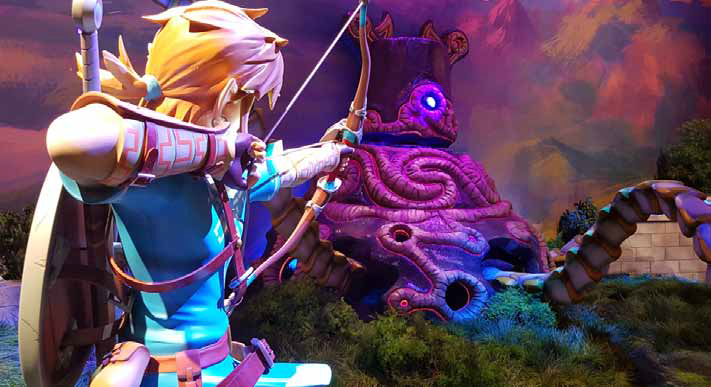 These are important as you’ll need to improve Link’s stats to tackle more challenging foes. Much attention has been made about the game’s difficulty level, and I can attest that it isn’t an easy play. Even the weather in Hyrule is a critical factor during exploration. For example, when you climb to the snow-capped peaks of a mammoth mountain, your body temperature will plummet and you will incur damage if you aren’t wearing the appropriate gear. If you don’t have winter gear, use the game’s simple crafting and cooking system to fry up some spicy peppers, which will raise your body temperature to a degree that averts hypothermia. It’s safe to say this game handles beautifully on Nintendo’s new console. Whether or not you want to spend $300 on what is basically just a Zelda machine at it’s current state is another discussion entirely. However, the game looks gorgeous whether you’re playing it on the go, or you’re lounging on the couch at home and playing it on your big-screen TV. 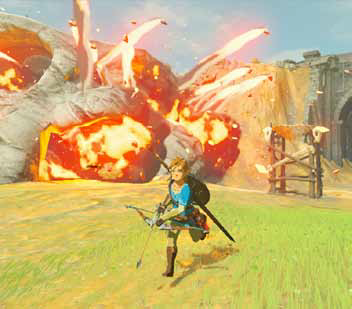 With an art style that feels like a unique blend of Twilight Princess and Princess Mononoke, Breath of the Wild is a mesmerizing world to explore. There’s not enough that can be said about a game of this caliber, but it’s definitely a pivotal moment for the constantly adapting gaming industry. 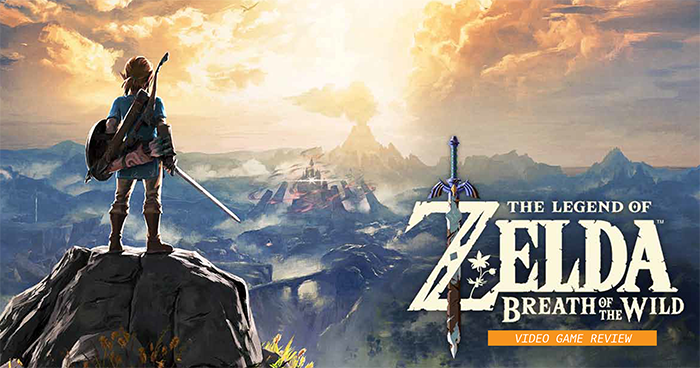 This is already looking to be a timeless installation for the Zelda franchise as well as a promising future for Nintendo’s latest console.